Whether you’re slumped over your desk like a Slinky® or straining to see your monitor, it’s easy to suffer from workplace woes that are related to your office setup. Here are some ways to keep your body finely tuned and pain-free during your workday. When seated at your desk, you should aim to have a 90-degree bend in your elbows for the keyboard at least. Be sure you don’t have your hands positioned way up high, or your wrists extended a great deal. You want to avoid carpal tunnel or tennis elbow so try to have the monitor at eye level. By doing so, you’re not sitting with your neck flexed or looking down at the monitor for prolonged periods at a time. Another position you want to avoid, particularly if you’re a woman, is crossing your legs. That’s because doing so puts pressure on the hips. You may have heard that sitting is the new smoking. Sitting for too long has been linked with various health conditions. 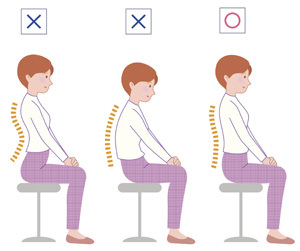 We recommend that, for every 30 minutes of sitting, you stand up and walk around or stretch for five minutes. An array of adjustable standing desks is on the market, allowing you to switch positions throughout your workday. Conversely, if you’ve been standing for 30 minutes, it’s a good idea to sit down and let your body relax to reset the musculature. This action helps ensure that the muscles are contracting, so they don’t stiffen and become irritated. When considering an office chair, make sure you choose one with good lumbar support, so you don’t lose that critical curve in the lower back. If that occurs, it could result in a host of issues such as sacroiliac joint dysfunction or neck and upper back issues as a result of compensation. Sometimes we all need little reminders to get us to take action. When it comes to putting more movement into our day, a wide range of free fitness apps is available for your smartphone. Of course, activity trackers such as Fitbit also can help to get your heart pumping. If you have questions about how to work ergonomically, contact the practice today.